DJ Swabedoodah, aka Roman J. , was born in 1977 in the middle of Germany. His Dad introduced him to classical psychedelic music, like Brainticket, Pink Floyd, Can, Kraftwerk etc, at the age of 13. In this time he also discovered a lot of other styles like Blues, Reggae, Dub, Skatepunk, Rock and more, just to name a few. He noticed that good sound can be found in nearly all musical genres, and was on a searching expedition for a while because he also knew that there must be something extraordinary smashing what he didn’t found until then. 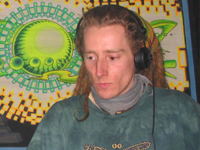 1998 the quest had an end when he visited his first psychedelic trance party in the legendary Cult club… He was infected by the power and the community right away and traveled to parties and festivals all over Europe and began to organize small underground parties in his hometown under the name “Swabedoo”. In these times, around 2000, he also began to collect sound – mainly vinyl, and soon he also made his first steps on the decks. After his record players get broken he changed to CD and what started just as a private hobby became more and more professional. In the beginning of 2005 he started to play at small underground parties in the area he lives and after a while he sent a demo to P. Schock (Cosmophilia / Spontaneous Aerobics). The demo convinced P. Schock that much that he offers Swabedoodah to play at different events in Munich and soon he became a label DJ for Spontaneous Aerobics. He spread more demos to different organizers and got a huge feedback. After a very short time he played several parties and smaller festivals nearly all over Europe.